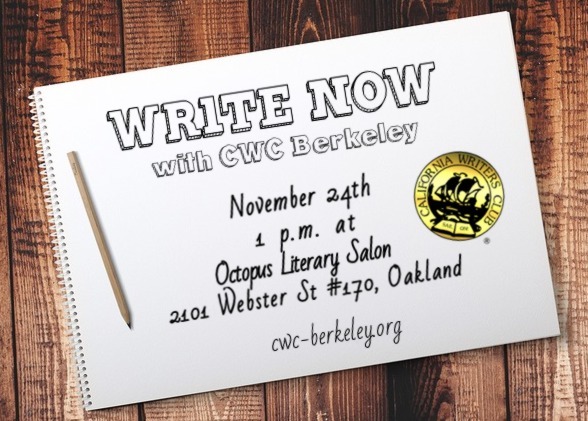 Join us Saturday at the Octopus Literary Salon for an afternoon of quiet writing. Bring your favorite writing tools and order drinks, lunch, or stay afterwards for dinner. At 6 p.m., the Octopus will host a Small Business Saturday. As we write, the Octopus Salon will be decorating, hosting a gift bazaar, and getting festive for an evening bluegrass jubilee. Thanksgiving out of the way, this event is the day after Black Friday/Plaid Friday/Buy Nothing Day, a perfect Saturday to focus on GETTING SOME WRITING DONE. This event is free and open to the public and co-hosted by Authors Large & Small.